Vaccination rates against measles are worryingly low at about half of Maine schools with kindergarten classrooms. Maine has recorded no cases of measles this year, but an outbreak has sickened dozens of children in the Pacific Northwest, and additional cases have cropped up in Connecticut in recent weeks. 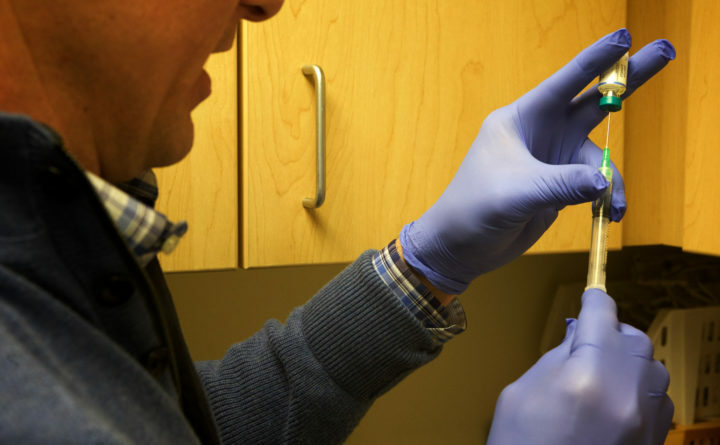 The last confirmed case of the illness in Maine was in 2017 — in a patient who had recently traveled overseas — marking the first appearance of measles in the state in two decades. Pockets of the state continue to be vulnerable to the illness. At about 160 Maine schools, fewer than 95 percent of kindergartners are vaccinated against measles, according to state data for the 2017-18 school year. The state surveyed about 12,500 kindergartners but could not get records for 150 students. Somerset and Knox counties had the highest percentages of schools where fewer than 95 percent of kindergartners had the measles vaccine, followed by Sagadahoc, Hancock and Lincoln counties. Like the state as a whole, about half of Maine’s religiously affiliated schools with kindergarten classrooms had measles vaccination rates below 95 percent. Once rates dip below that threshold of 95 percent, experts worry about the threat to “herd immunity,” or when enough people in a group are vaccinated to prevent the spread of disease, even to unvaccinated individuals. “Even if 5 percent of kids aren’t vaccinated, particularly with measles because it’s so highly contagious, that is often enough to break through the herd immunity,” said Dora Mills, senior vice president of community health at MaineHealth and former director of the Maine Center for Disease Control and Prevention. Children should get vaccinated before entering kindergarten, according to the U.S. Centers for Disease Control and Prevention. Statewide, 94.3 percent of kindergartners were vaccinated last school year, though the first grade rate was 96.1 percent, according to the Maine School Immunization Assessment Report. Measles is one of the most contagious illnesses known to man, lingering for up to two hours on surfaces and in the air after an infected person has departed, Mills said. “You don’t even have to be in the same room as somebody, and you can still contract it,” she said. Infected people can be contagious beginning four days before the characteristic rash appears, with symptoms such as fever, cough, runny nose and red eyes that can at first resemble many other viral diseases. If an infected person coughs or sneezes in a public place, the risk of transmission is high, particularly to those with compromised immune systems, Mills said. Measles can cause severe complications, including pneumonia, respiratory problems, brain swelling and even death, according to the Maine CDC. Symptoms typically start 10 to 14 days after exposure, but potentially up to 21 days later. The best protection against measles is vaccination, according to the Maine CDC. Two doses of the vaccine are about 97 percent effective at preventing the disease. Students are required to get shots to attend school, but Maine is among 17 states that allow parents to exempt their children from immunizations for philosophical reasons. Parents may also decline immunizations on medical or religious grounds, but the majority cite philosophical objections. New legislation aims to change that. Rep. Ralph Tucker, D-Brunswick, plans to introduce a bill that would eliminate the philosophical and religious exemptions. Proponents of “vaccine choice” are already promising to push back. Supporters of the bill will include the Maine Association of School Nurses. Without an exemption, students in kindergarten through 12th grade at Maine’s public and private schools must receive two doses of the measles, mumps and rubella vaccine. At Hogan’s school, Camden Hills Regional High School, “I have a lot of students that are not immunized against measles, mumps and rubella,” she said. She and the school physician recently sent a letter to the families of students who are exempted from vaccinations urging them to consider immunization, she said. Mills recalled treating measles cases years ago in East Africa, where the disease was prevalent and the vaccine difficult to access. Parents would walk for a full day to get their child immunized at a hospital, she said. Mills went on to treat more measles cases at a children’s hospital in Los Angeles during an outbreak in the late 1980s. A couple of children died from the disease, she said. “I’ve seen parents go to such extreme extents to get the vaccine, and I’ve seen children die of [measles], and to see parents in this country who are refusing the vaccine for their children and putting their children and other children at risk, it’s just beyond comprehension,” Mills said. Washington state has recorded nearly 50 measles cases this year, mostly among children under age 10, prompting health officials to declare a state of emergency. Hardest hit is a county with one of the lowest vaccination rates in the state against the highly contagious disease. In the Northeast, Connecticut officials recently confirmed two cases of measles in two adult patients. Anyone who thinks they’re developing symptoms of measles should contact their health provider before arriving at the office or hospital, so the provider can take precautions to prevent spread of the disease, according to the Maine CDC. Most measles outbreaks in the U.S. have started with unvaccinated people who travel overseas, pick up the virus, then return home and infect other unvaccinated individuals. As Maine students prepare for February vacations, health officials are urging vaccination, particularly for those traveling internationally.